Spectacularly sited on Walker’s Hill, overlooking the Vale of Pewsey, Adam’s Grave is all the more impressive by being built on the highest crest of a ridge. The view from the barrow is stunning, with the Knap Hill causewayed enclosure to the east and the escarpment of Salisbury Plain to the south; on clear days the spire of Salisbury Cathedral can be seen, some 25 miles away. The barrow is steeply ridged and survives to a height of 6.5m above ditches 1.5m deep; its length is around 65m. The width tapers from 28m at the south-east end to 16m. In the 1950s some of the internal structure could be seen, as parts of a sarsen chamber and some drystone walling of alternate sarsen and oolite protruded. It has since been covered up. 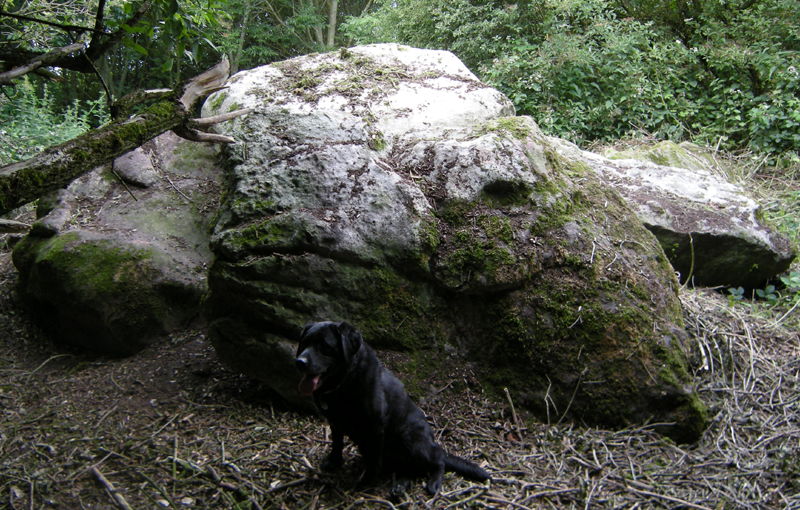 Today there are just two small pieces of sarsen showing – one at either side of what would be the entrance. Locals assert that stamping on top of the mound during a long freezing spell produces a hollow sound from the chambers within. John Thurnam excavated in 1860, finding a number of skeletons and a leaf arrowhead. The bones were lost but the flint is in the British Museum. Stukeley in 1743 sketched and described a long barrow, “among the furze bushes south of Silbury” as being “22 paces long, composed of chalk, pointing directly to Overton Hill which bears from it ENE.” Elsewhere he states a length of 100ft and that many stones formerly stood at its eastern end. The barrow had been surrounded by recently removed peristaliths. Stukeley cites it as being on a line from “The Four Barrows”, largest of which is at SU 11510 68660 (51°25.010'N, 1°50.152'W). The line passed through a now missing round barrow at SU 10240 67880 (51°24.591'N, 1°51.250'W). This line projected SW passes the eastern end of Beckhampton Plantation at the position suggested above by Barker, who also believes that an Aubrey drawing, long thought to be the West Kennet long barrow, is actually of the barrow at Beckhampton Plantation. 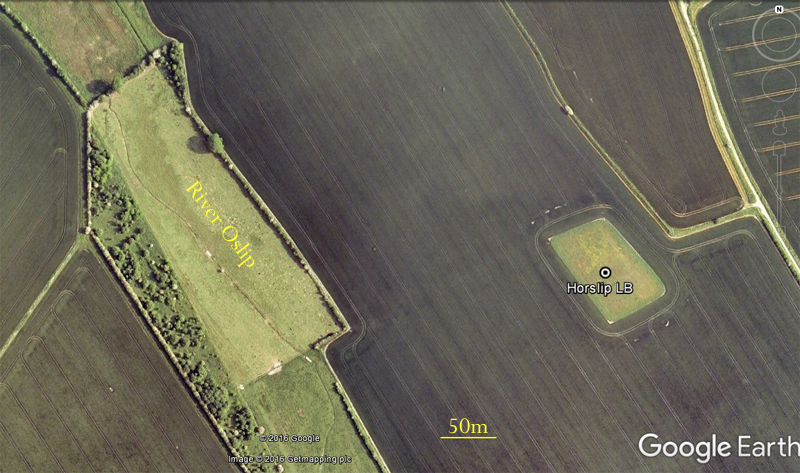 The site is on an old field boundary, 800m west of the Beckhampton Penning stone circle, and matches with Stukeley’s observation that Avebury’s steeple and Silbury were just visible from the barrow. There is nothing to see today except a slight hump in the ground, but small pieces of broken sarsen can be found. An alternative position for the barrow is sometimes given as SU 08620 67060 (51°24.150'N, 1°52.648'W) where OGS Crawford found sarsens and a slight mound by the track that runs south to Rybury. But this was in 1920 and there is nothing today. However just a short way north, where the track meets Beckhampton Plantation, there are large sarsens that could conceivably have come from inside a barrow. Sited alongside the Beckhampton to Devizes road, this earthen long barrow has been almost ploughed out - surviving only to a height of 0.7m, it is easily missed. Stukeley described it as very long and “pyriform”. It was probably excavated during 1855-67 by Thurnam, who failed to find anything. In 1964 Isobel Smith excavated the barrow, which was then 133ft long, though its original length is thought to have matched the N and S ditches, 162ft and 170ft respectively. Smith discovered that the barrow had no chambers or burials, finding instead, “a framework of fencing - an axial line of stake holes with offsets at right angles and lateral lines closing off the bays thus formed”. These 20 or so bays were then infilled with material from the side-ditches, with wooden poles and brushwood spread between successive layers. The mound was partly revetted with chalk gravel. Inside were a few sherds of pottery and animal bones, including three cattle skulls spaced along the mound, placed just above the original ground surface. More animal bones were found scattered throughout the mound, with a few small pieces of sarsen and one larger piece - perhaps it was used for hammering in the stakes? The remains of an Early Bronze Age round barrow with a ditch, later superimposed on the eastern end, can just be made out today. The OS map of 1817 shows nothing, but a mound is indicated on the 1898 OS map at the above position. 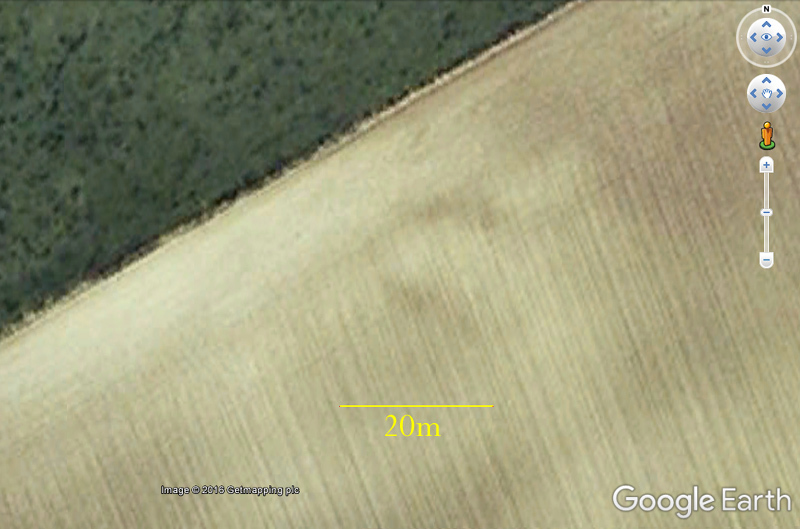 Today the site is ploughed and for most of the year there is little to see, but Google Earth shows a chalky patch there (though only on the 2002 image). This white patch is particularly clear in the early spring when the ground is prepared for a new crop. Although it is not absolutely certain that this was once a long barrow, it does seem likely. These few large sarsens are probably all that remains of a chambered long barrow, although the monument has also been described as a dolmen, cromlech, kistvaen or portal tomb. 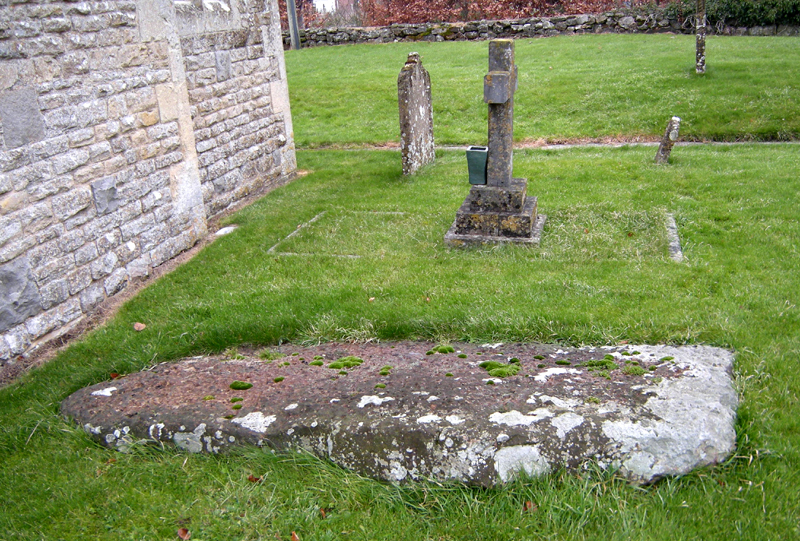 The horizontal capstone that formed the roof of the chamber is supported by two upright stones, one of them leaning; inside are two more large fallen stones and 16 smaller fragments. The barrow, though ruined, was still visible in 1921 when the stones were re-erected and the vertical one of the two uprights set in concrete. Although the restoration has been much criticised, the pictures show that it now appears essentially the same as in AC Smith's 1884 engraving. On the top of the capstone are at least two well-defined hollows that first appear to be man-made cupmarks but are actually natural. They were described in 1909, with the local legend: “if anyone pours water into any of the natural cup-shaped cavities on the top stone at midnight, it will always be found in the morning to be gone, drunk by a thirst-tormented fiend.” (1) The same writer also reported that the spirit of a white rabbit with glowing eyes was said to appear on the capstone at midnight and help the devil to demolish the site, assisted by eight oxen. Thurnam dug into the Easton Down long barrow in 1860, finding “four human skeletons, two adult males and two apparently young persons. The teeth were much worn.” He also found a few chippings and fragments of sarsen, adding the mound to his list of ‘unchambered’ barrows. The barrow is clearly visible today, as it is still an impressive 5m high and is sited on top of a small hill. It currently measures roughly 40m by 28m. No longer ploughed, it is thickly covered in nettles and other weeds. There are wide, ranging views all around from the barrow, but only a tiny glimpse into the Vale of Pewsey – all that can be seen is a small part of the southern escarpment. The overall shape is quite well preserved, though the side ditches have been obscured by past ploughing, which has also eroded the edges. A few small pieces of oolitic limestone have been found, which some have used as evidence to classify the barrow as stone-chambered. But this seems unlikely and it is probably earthen. Easton Down was partially excavated by Alasdair Whittle in 1991 (?) - it's published in PPS in 1993. AW's work didn't add much structural detail, other than hints of compartmentalised structure as at South Street and Beckhampton Road, and evidence that a natural knoll was scarped to mark the mound look bigger, but there's a good environmental sequence. Despite its covering of trees and nettles, the size of this long barrow is still very impressive - 99m long and roughly 30m wide, it stands 4.2m high at its southern end. The mound appears relatively undamaged, but despite an often-repeated claim that it is completely unexcavated, it has been dug into several times. Dean Merewether reported in 1851 that men digging for flints at the southern end were forced to give up the work when the flat sarsens that made up the barrow kept tumbling down on them. The barrow is largely made of chalk dug from the now silted-up side ditches, so the sarsens were probably supporting the burial chamber presumed to be inside. AC Smith in 1885 reported seeing small sarsens in a hollow at the southern end, but they are gone; there is just one brief published reference to a burial chamber from 1864. 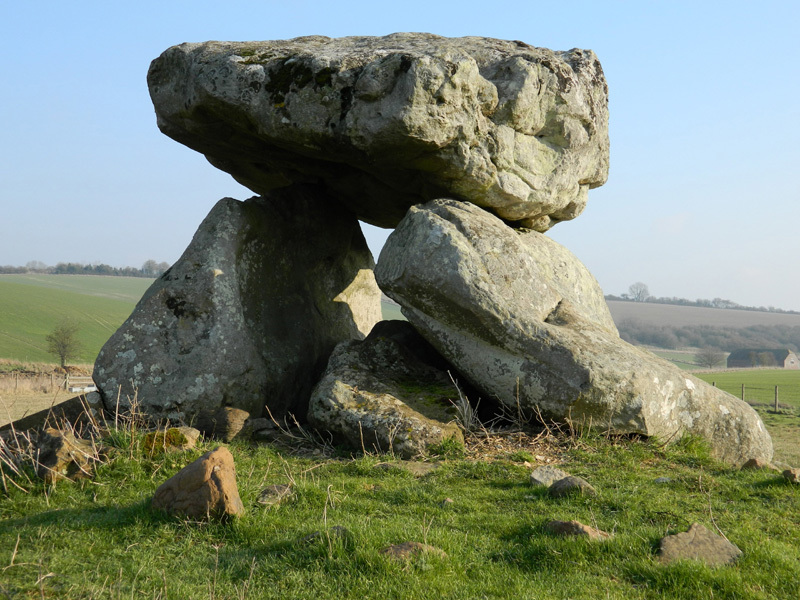 (3) Since the barrow so closely resembles that at West Kennet in shape and size, it is thought likely to contain similar stone chambers. Sited on the southern slope of Windmill Hill and now almost invisible, this monument was excavated in 1959 by Paul Ashbee, after it had already been deliberately levelled. There was “no sign of either stone or timber structure”. The barrow was rectangular, with parallel side ditches some 50m long. No large sarsens were found at the site, but the many stones piled up beside the track at Horslip Bridge could have come from inside a barrow and Horslip is the nearest. Some stones from the same pile were used in the garden walls of Swan Cottage on Bray Street. 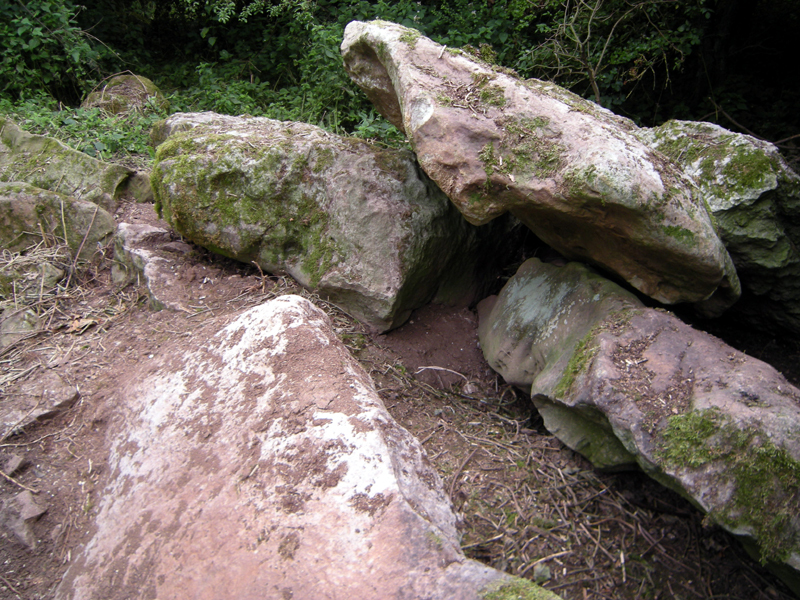 Slabs of sandstone were found above the mound, which have been traced to a source in the Mendips. Large blocks of chalk found in the ditch may have been used as revetment. The mound was made of chalk rubble, interleaved with humus, in which was found “a compact deposit of ox bones and two pieces of antler”. IN 1957 this long barrow was described as: “132ft by 36ft by 4ft high, orientated NW/SE, traces of side-ditches; sarsen and hollow at SSE end”. (4) Rounded at its south end, it was tapered to the north. Still marked on recent OS maps, the barrow is shown tucked against a hedge-line; but the hedge no longer exists and neither does the barrow, which has been completely ploughed out. Typically, Thurnam got there first and excavated between 1855 and 1867. At the north end he found skeletons, which are now missing. Thurnam described the barrow as ‘unchambered’ and no stones have been found. This barrow commands a spectacular position overlooking the Vale of Pewsey, in a remote spot where the only sound comes from skylarks and the occasional distant tractor. It must be visited to be fully appreciated – the views are breathtaking and photographs fail to do them justice. Today the barrow is in a poor state though impressively high still; its southern side is being eroded by a very large badger set. Grinsell in 1957 gave the barrow’s dimensions as 106 ft by 70 ft by 7.5 ft, noting that its ditches curved slightly inwards at the NE end, where a sarsen could be seen protruding. There is no sign of that particular sarsen today, but the report is taken to be an indication that the barrow is chambered. 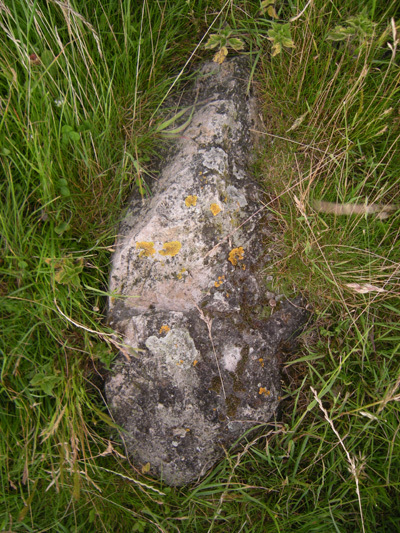 However, on a visit in 2011 I did find a piece of sarsen around 0.5m long, partly buried in the top of the mound. Of this monument, if it ever existed, nothing can be seen except a slight bump in the ground. OGS Crawford believed it to be the eastern half of a long barrow. Grinsell measured it in 1957 as 105ft long, 75ft wide and 4ft high, pointing ENE, adding: “No obvious side-ditches. Doubtful, much reduced by ploughing”. There is no record of stones ever having been found, so if there was a barrow, it was probably earthen. Found from aerial photography, this ploughed-out barrow appears to have been around 36m long, with tapering side-ditches that showed up well as parch marks in 1995. (5) There has been no geophysical survey and the site is now covered with bushes. Type unknown. Visible from the A4 at the Beckhampton roundabout, this large barrow was already damaged by farming and chalk-digging when Stukeley recorded it in 1743. The SW end has been ploughed and where the NE end is dug away, was until not long ago used as a rubbish dump. The mound has been cleaned up in recent years, with its covering of trees removed. Current size is 84m long, 35m wide and up to 6m high, with prominent side-ditches each 24m wide. Dean Merewether excavated in 1851 but failed to find a burial, only secondary deposits such as a Bronze Age urn containing burnt bones (now in the Devizes Museum) and a bronze object described variously as a spear head or a dagger. AC Smith in 1885 noted seeing two sarsens on the top. They are now gone, but could well indicate that the barrow is chambered. Once an oval, chambered long barrow, the monument was bulldozed flat in 1952 by a newly-arrived tenant farmer who had not been told it was of any importance. In 1955 Atkinson conducted a ‘rescue’ excavation but typically, failed to produce a report. Buried in a pit in the forecourt was the skull of an ox that may have been pole-axed, and sherds of Windmill Hill pottery. Glyn Daniel noted in 1950 that the mound was 65ft long, 35ft wide and 3.5ft high; the remains of a burial chamber at the eastern end could be seen to be “not more than 6ft square internally.” There were traces of stone revetment and one surviving peristalith: in the mid-19th century, Hoare had described the mound as being “set round with stone.” The stones of the chamber had been exposed for centuries, as shown by Aubrey’s drawing from the late 1600s. 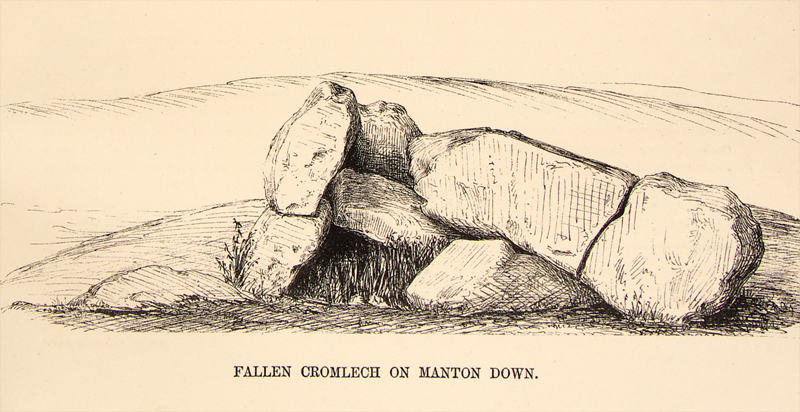 On the first OS map from 1815 it is indicated as a cromlech and on later maps as a kistvaen. There has been considerable confusion as to this barrow’s position, but the one given above featured on OS maps until the 1960s and is correct. Official records state that in a patch of scrub 10m to the north are five large sarsen slabs and smaller stones, believed to have come from the barrow. Yet satellite pictures show there is no such patch of scrub and there has not been for many years – the field is entirely ploughed and featureless. It seems that history has repeated itself and the Manton Down long barrow has now been ploughed out and vanished for good. Barker, in 1984, claimed the barrow’s true position was some 350 m to the west, at SU 14780 71350 (51°26.457'N, 1°47.324'W) where he found a pile of sarsens in a hedge. I visited several times and found only field clearance stones. There is still a puzzle: Rev AC Smith witnessed the splitting of the capstone by workmen in around 1885, but there is no sign of this. However as well as the six huge stones piled up now, there is at least one other large stone almost completely buried in soil: perhaps the two pieces of the broken capstone are buried there? 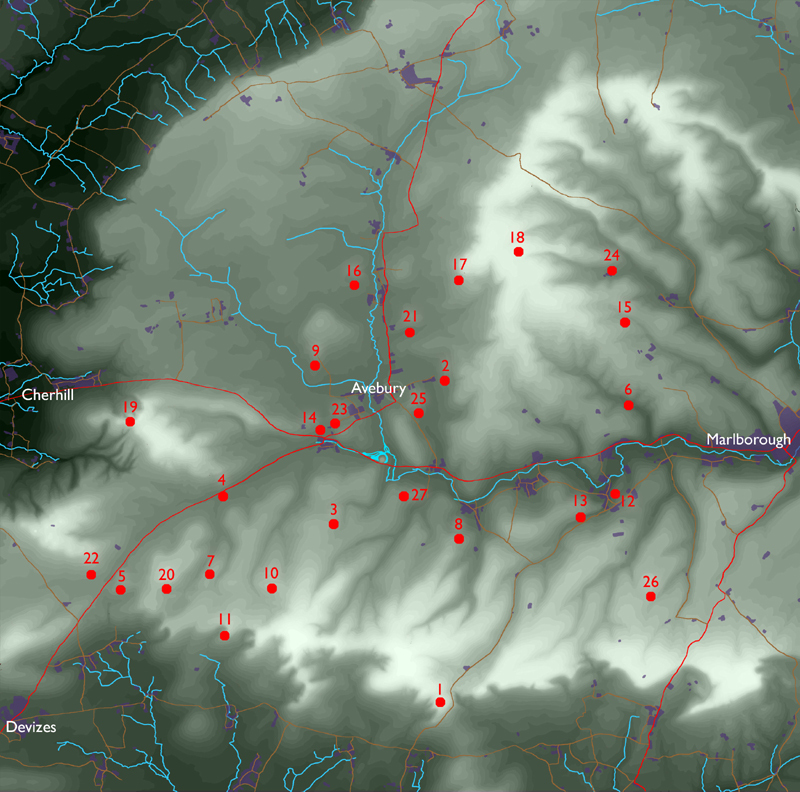 Manton Down was (as you state) where the Ordnance Survey always said it was, and there are aerial photos proving this. Also, there’s no confusion about what happened to the stones of the chamber – Atkinson moved them (by mechanical digger) to the edge of the field and there they have remained until this day. None of this was in any doubt until Christopher Thompson Barker muddied the waters with his misunderstandings of what Atkinson (with self-admitted failing memory) was telling him. What Barker (or anyone who’s tried to work this out later) failed to realise is that the difficulty in relating Atkinson’s statement that he’d moved the stones to the edge of the field with the fact that there are no stones at the edge of the field is because the edge of the field has moved. The stones are where Atkinson left them. You’ve seen them yourself. I think that what Barker saw were these same stones, and he just wasn’t too exact with his grid ref. The stones certainly aren’t the remains of the barrow ‘intact’ , but they are without doubt the remains of the chamber. I have Atkinson’s excavation archive, and have been working on getting this site properly written up and published for some time. Atkinson’s photos make the identity of the stones you’ve photographed beyond doubt. They are very distinctive and recognisable. In its prime, Millbarrow must have been extremely impressive: Stukeley in 1723 measured it at 215ft long and 55ft wide. 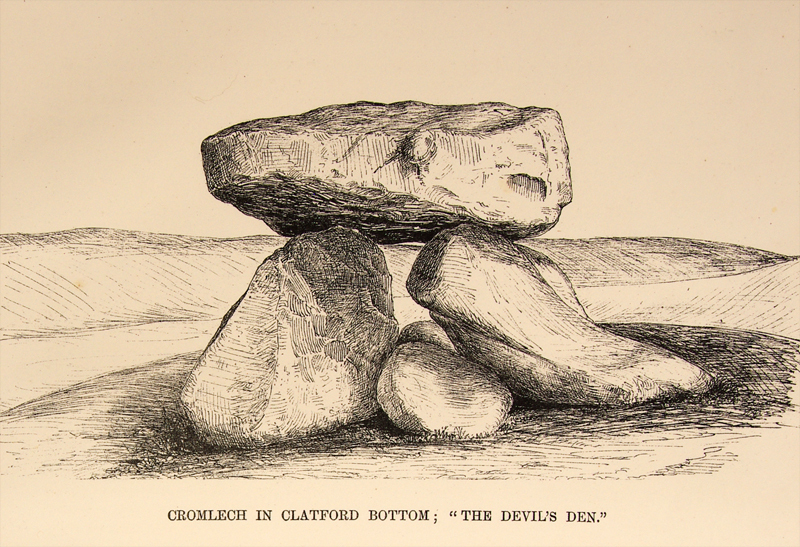 Aubrey earlier had drawn the barrow, with its exposed stone chamber and peristalith of 29 stones “six or seven feet high” which were still standing, noting that the mound was “a yard high at least”. In the mid-19th century a farmer levelled it. Merewether notes an account by one of the labourers involved, of finding a ‘room’ of big sarsens fitted closely together as if by a mason; it was filled with evil-smelling ‘black stuff’ that was probably decomposed turf. Nothing else was found except a few animal and human teeth, and a jaw-bone. Thurnam found nothing in 1863. The stones were all robbed out - Stukeley reports one being used in a bridge at Monkton; another was taken by Rev J Brinsdon, parson of Winterbourne Monkton, for his own gravestone. It can still be seen today, just to the east of the church (below). Seven huge sarsens, likely from the barrow, are piled up by a barn not far from the site (below). Many more stones can be found in garden walls and gateposts around the village, some stacked in piles along the course of River Winterbourne. Stones erected in 2004 by the Swindon road at SU 10040 71933 (51°26.777'N, 1°51.415'W) came from the foundations of Low Bridge (where more stones can be seen) and may have originally been Millbarrow’s peristaliths (below). A 1989 excavation led by Alasdair Whittle determined that the barrow originally had double ditches, with two on either side of the mound. There were few finds except some postholes, and pits containing human remains, that appear to pre-date the mound. Pieces of human bone and antler produced radiocarbon dates from the later 4th millennium BC. Considered ‘doubtful’ as a long barrow, this oval mound can still be seen at the foot of the Upper Escarpment. It was measured in 1957 at 90ft by 45ft and 3.5ft high. Merewether drew it in 1851, showing a facade of eight stones at the SW end (the opposite end to where they may be expected), but his plan was regarded as ‘unreliable’ by Grinsell. Merewether made a cutting along the entire length - on the south side, near the centre of the mound, he found half an ox’s forehead, fragments of deer horn and the tip of an ox horn. At the NE end, just a foot below the surface, were the head of a greyhound and part of a Roman ampulla, presumably secondary deposits. Four sarsens could be seen protruding from the western end in 1914 but there was no sign of any ditches. Now completely vanished, this mound was sited immediately NW of ‘Old Chapel’ – a rectangular earthen enclosure that has also gone. The enclosure is thought to have been mediaeval. William Stukeley visited in 1723 and 1724, making notes and drawings that are detailed but inconsistent. Recording the monument’s dimensions as 100ft long and 27ft wide, Stukeley describes at the SE end “a semi-circular cove… of five great stones” but elsewhere his sketch clearly shows seven stones. At least two of the stones were 10ft long. Stukeley shows a box-like structure resembling a burial chamber, sited unusually at the NW end, but he shows no side-ditches. Burl has suggested that the monument may have been multi-phase, with the mound and facade being added to an existing tomb. Sited spectacularly on a hill crest close to the Cherhill Monument and White Horse, this barrow is in a sorry state. Three skeletons were found in 1864, in a large shallow grave surrounded by small sarsen blocks at the eastern end, where stones can still be seen. The bones were accompanied by pottery, flakes of flint, charcoal and wood-ash. Cunnington excavated shortly after the discovery, but found only a cist 6ft 8” in depth and 2ft wide by 3ft long, containing wood ash. Three skulls from the barrow still survive – a male in the Thurnam Collection at Cambridge and two females in the Devizes Museum. There is some confusion about the barrow’s length: Cunnington gave it as 60 feet, which may have been misread as yards - Crawford states 180ft, which is usually accepted as correct. Generally thought to be stone-chambered, Paul Ashbee interpreted the barrow as potentially timber-chambered, with the ‘cist’ as a post-hole. Barker (2) lists another possible long barrow - ‘Calne Without’ only 140m to the west at SU 04550 69330 (51°25.377'N, 1°56.157'W). Though considered doubtful, it could be the middle section of a long barrow whose ends have been destroyed by chalk-digging. 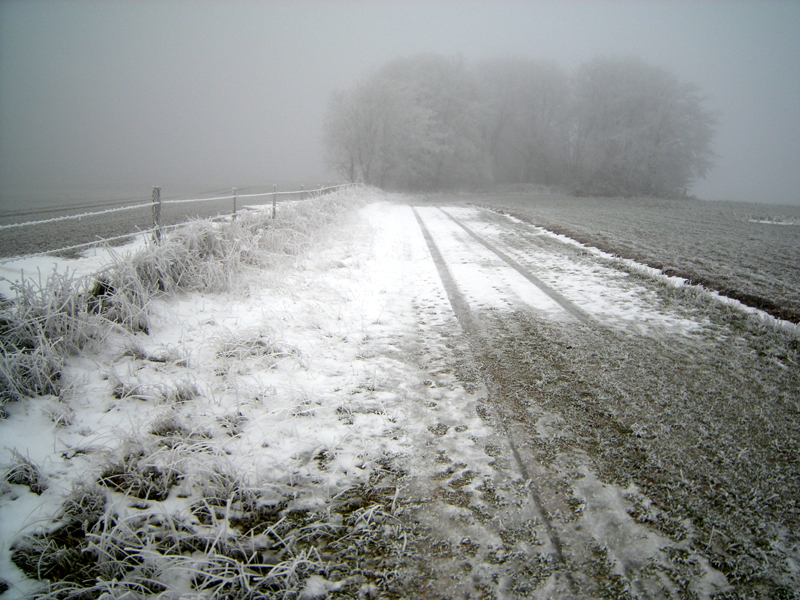 Isobel Smith believed that traces of side-ditches could be made out in certain conditions. 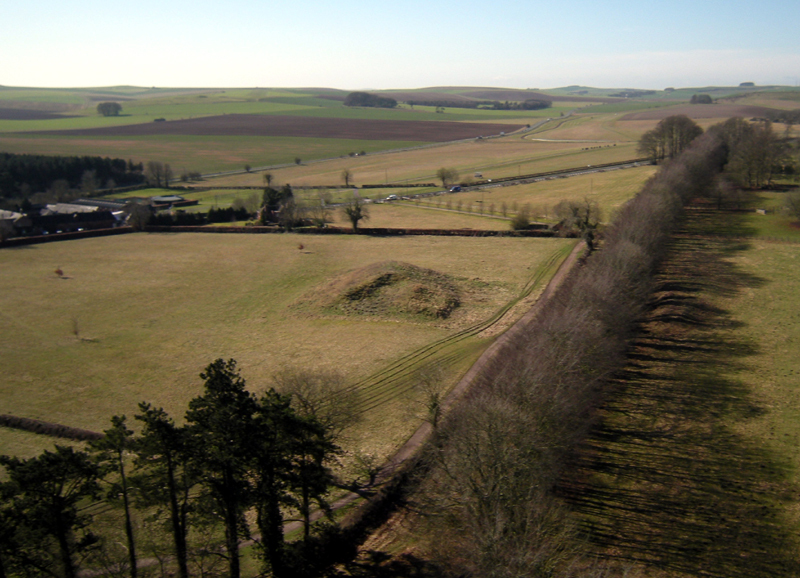 Discovered by aerial photography in 1957, the long barrow can still be seen in an area of set-aside close to the Wansdyke, which partly overlies it. The barrow’s size was estimated in 1973 to be 70m long by 40m wide and up to 2.5m high. 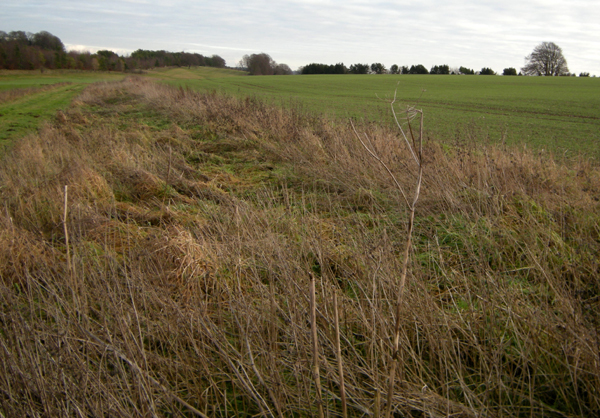 The southern ditch is ploughed out, but the northern one can just about be seen. Type is unknown, but no sarsens have been reported in the vicinity. Two early Bronze Age round barrows also on the hill were excavated by Proudfoot in the 1960s. Beneath them were found traces of pits dating to the early Neolithic. The largest was over 2m across and contained pottery sherds from over 30 pots; worked flints, a broken polished axehead; bone pins, antler, a sarsen polissoir; bones of cattle, pigs and sheep, and a piece of human bone. In the base of another was a human cremation. It seemed that the site had been occupied for a few months (or years) and at that time was a clearing in woodland; the pits were perhaps ceremonially filled in at the time the people moved on. First described by AC Smith in 1885 as “now widely spreading” this barrow was damaged long ago. Maud Cunnington excavated in 1926, recording the dimensions as 90ft by 55ft. She found the base was formed of a compressed layer of turf 2ft thick in the centre; in the top of this layer were pieces of sarsen, oolite and upper greensand rock. Although the primary burial had already been removed, there were "traces of a grave" in the underlying chalk. Also, in the undisturbed SE side was a floor paved with five slabs of oolite. Human bones from five individuals were found – mostly on top of the slabs, though some were beneath it. The bones, identified as three adults and child, were unburnt but all broken, disarticulated and incomplete as skeletons. There was “not a single fragment of pottery throughout.” Atkinson and others have suggested that although the slabs of oolite suggest a stone chamber, this may be a timber-chambered long barrow as several examples have stone pavements on which burials were placed. There appear to be no side-ditches at Shepherd’s Shore – have they just not been found, or was there another, more convenient source for the mound material nearby? Aubrey and Stukeley both described and illustrated this monument. "In Monkton Fields is a long pitched stone seven feet and more; it leaneth eastward upon two stones" wrote Aubrey. Stukeley described "a monument of Four stones, which is probably a kistvaen" and situated "directly north-east from Abury". 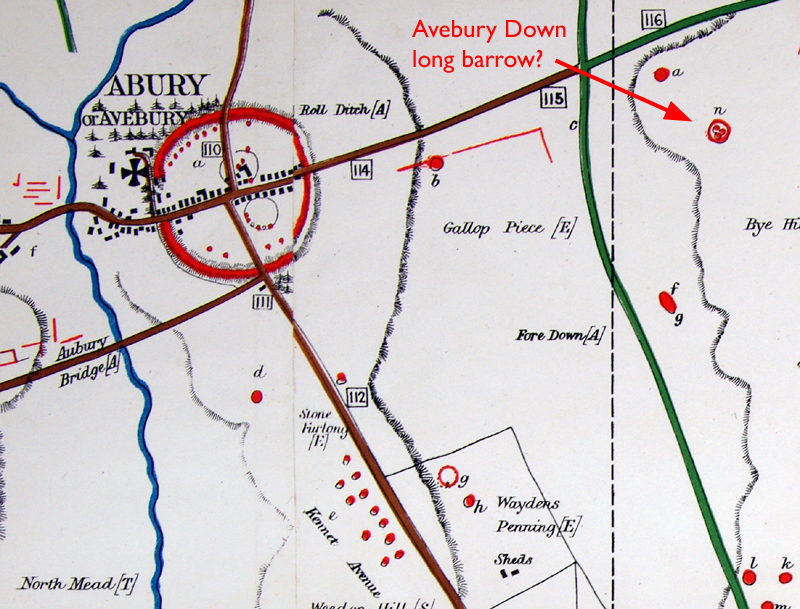 He marked the site on one of his maps as east of the road from Avebury to Swindon. The exact location has never been found; however, an old tithe map indicates "Shelving Stones Field" at approximately the position above. A geophysical survey may eventually solve the mystery. Now barely visible, this ploughed-out earthen long barrow was first recorded by Stukeley, who made several sketches and thought there must be a stone chamber within. When excavated in 1964-7 by Paul Ashbee, the mound was just two feet high. Its internal structure was found to be very similar to that of the Beckhampton Road long barrow, with a framework of hurdles projecting at 90° from a central ‘spine’ and forming 20 bays along each side. The mound was approximately rectangular, 41.3m long and up to 15m wide; it appeared to be unfinished, as did the northernmost of its two parallel side-ditches. Five large sarsen boulders, three of which had been broken, were carefully positioned within the fencing, which in places curved to avoid them. Each of the 40 bays was filled with material from the ditches, in the order in which it was excavated: first the turf was placed against the central line of stakes, followed by chalky topsoil, coombe rock and finally chalk. Ashbee thought that the entire mound may then have been capped with chalk rubble (7). The southern, front end was finished off with a crescent of massive chalk rubble. Each of the bays was filled individually, with some irregularities. 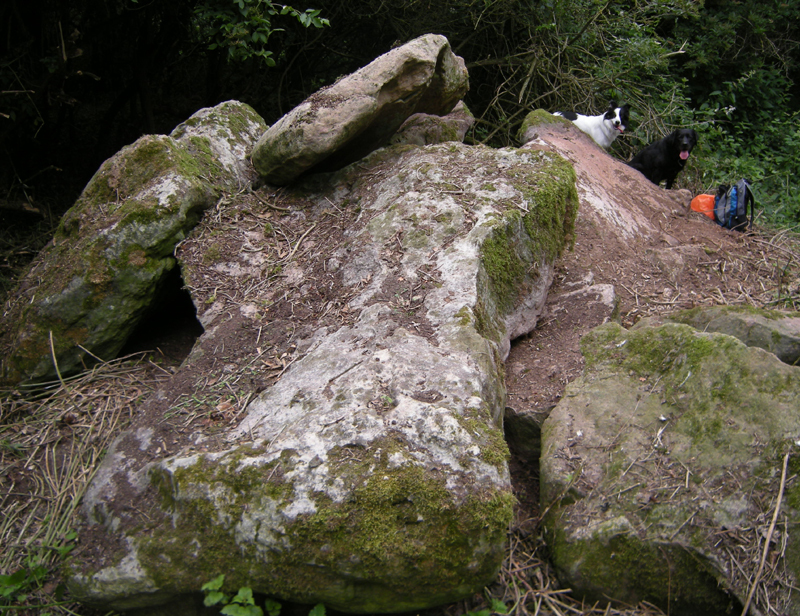 Small sarsen boulders were positioned in the fill, but not evenly – one bay had 22 of them placed against the central fence. There were no human burials, but four shoulder-blades of cattle and six fragments of red deer antler were found: they may have been tools for excavating the ditches. Other animal remains included the bones of a single pig, its small size suggesting it was domestic. Sheep/goat and cattle bones were also found. There was evidence of flint-knapping, which may again have been ritual – in the buried soil beneath the mound were 300 flakes, 11 flint cores and 22 core rejuvenation flakes (6). Many more flints were found in the soil of the mound itself. A pair of patinated microliths found in the pre-barrow soil indicate earlier use of the site; two sets of grooves cut into the chalk subsoil at right-angles to each other are thought to represent earlier cross-ploughing of the site, perhaps ritually. Two fragments of human skull were found, and sherds of pottery from several different periods. South Street was excavated by John G Evans (not always clear from the report). Nothing is known about this ploughed-out long barrow, which was discovered by Damien Grady in 2009 from his aerial photographs. 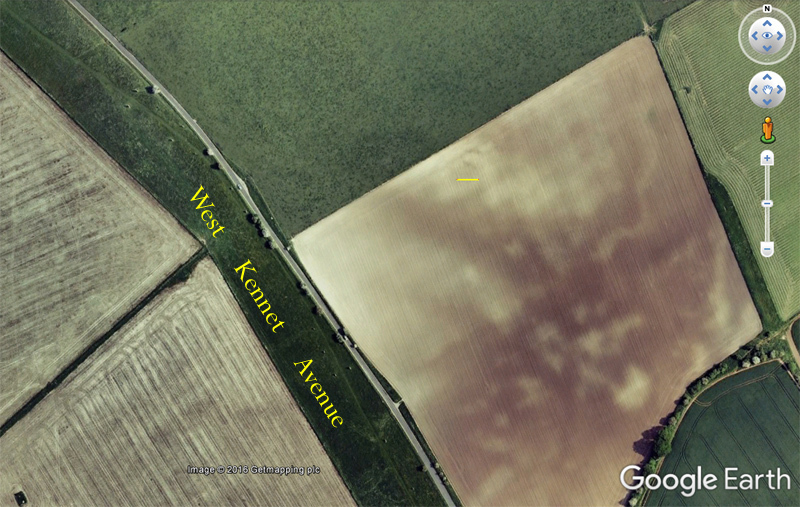 Google Earth clearly shows the flanking ditches, which indicate a trapezoidal design and may even continue as a horseshoe around the narrower western end. None of the Antiquarians mentioned a barrow in this position, so presumably it was ploughed out long ago. Local farm workers have reportedly discovered artefacts near the site of the barrow, including worked flints and a polished stone axe. Traces of the barrow can be seen on Google Earth (below). Although not far from a footpath, this barrow’s woodland position makes it difficult to find, as it is covered with undergrowth, and in the spring with bluebells. Several early accounts describe it as ‘round’ and even though it is labelled as a long barrow on the current OS map, it is drawn as a circular mound. Current size is 38m long, with a maximum width of 30m, reaching a maximum height of 3.3m at the eastern end. There are well-defined side ditches, silted but still over a metre deep. At the eastern end is another ditch, separated from those at the sides by narrow causeways. Sir Henry Meux excavated in about 1880. Inside what he thought to be the centre of the mound was a small cairn of sarsen stones. 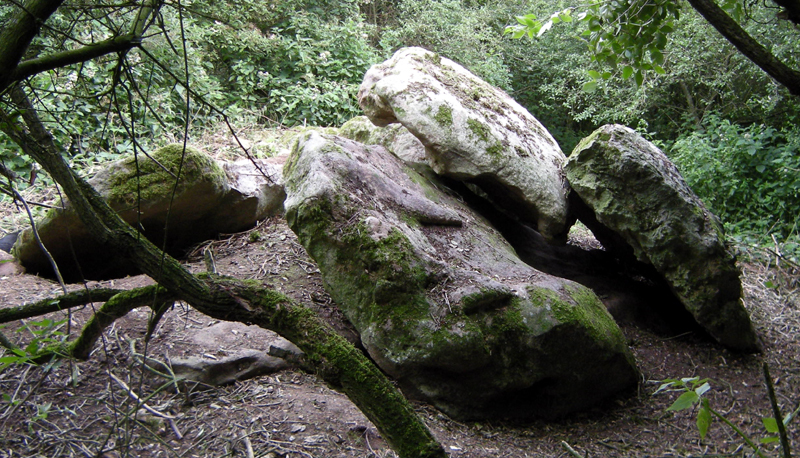 “In the centre of this was a dolmen consisting of four upright stones (the spaces between which were packed with large flints) and a capstone covering them, all of sarsen.” Meux levered off the capstone and found inside “certain black matter” which was probably decomposed turf. As nothing else was found, the capstone was replaced as it had been, and the excavation hole filled in (though it is still visible as a square depression). Meux noted: “The inside of the dolmen was about six feet by three feet, its longer axis coinciding with that of the barrow.” (2) It is not known if this was the only chamber, or whether there was also a passage. A great deal is known about this chambered long barrow. See Exploring Avebury: The Essential Guide pages 41 to 57. (1) Gomme, Alice B., 1909, Folklore Scraps from Several Localities, in Folklore Journal, 20:1,. (2) Barker, C.T., The Long Mounds of the Avebury Region, WANHS Volume 79 for 1984. (3) Lukis, W.C., Danish cromlechs and burial customs compared to with those of Brittany, the Channel Islands and Great Britain, WAM 8: 145-69. (4) Edited by R.B. Pugh and Elizabeth Crittall, 1957, A history of Wiltshire: volume 1, part 1 The Victoria history of the counties of England. (5) Featherstone, R., Horne, P., Macleod, D. and Bewley, R., Aerial reconnaissance in England, summer 1995. Antiquity, 69, 981-988. (6) Field, D., 2006. Earthen long barrows: the earliest monuments in the British Isles. (7) Ashbee, P., 1970. Earthen Long Barrows in Britain. (8) Smith, Rev. A.C., 1885. 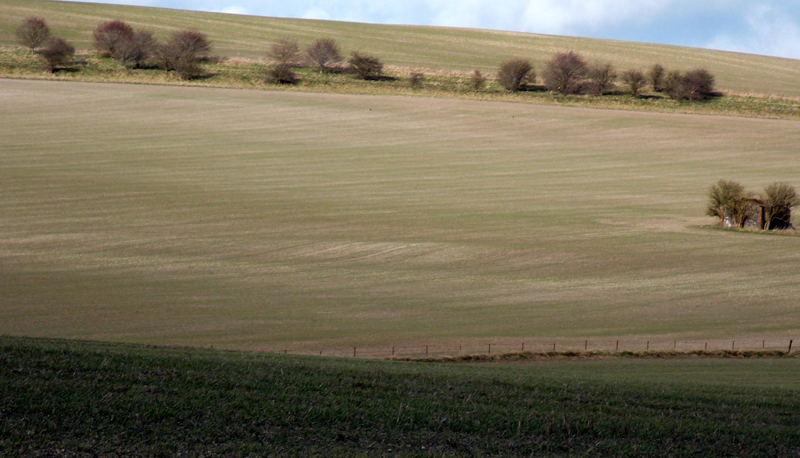 A guide to the British and Roman Antiquities of the North Wiltshire Downs. Text & images by Steve Marshall Copyright © 2016 All rights reserved.